If you are looking for classical, molded cogged, double “V”, banded, variable speed, wedge or metric V-belts we have you covered. A&I belts are made to meet or exceed all OEM and industry specs. So whether your needs call for a classical belt, or looking to reduce deflection by using a variable speed belt, you can rest assured that A&I belts will be there to perform to the max when you need them most. We know how important it is to get running, and stay running. That’s why A&I has brought our high quality standards to our new line of V-Belt Sheaves. 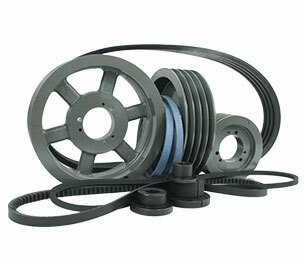 If you are looking for OEM quality V-Belt Sheaves without the OEM price, A&I is your answer. Our V-Belt Sheaves are engineered to meet the most stringent industry specs. They are built with your needs in mind; high performance, long life, and low maintenance. Our V-Belt Sheaves are strategically stocked at key warehouses around the country to support your immediate needs. A&I is proud to introduce our new line of power transmission bushings. Made from highly engineered 1045 steel, A&I once again brings the OEM quality you demand without the OEM price tag. Partner an A&I Belt, Sheave and Bushing together to offer a high performance, low cost solution that your customers will appreciate and depend on.